„Human Forestry“ is a political statement and a critical act, but also a real life exposure of exploitation and instrumentalization of human labor and natural resources in the context of relations between the Western and the Eastern Europe. Although we, the Estonian artists of 10 x 10 meters, have been working without salary on this performance, the statement is not only focused on the matters of contemporary art system. 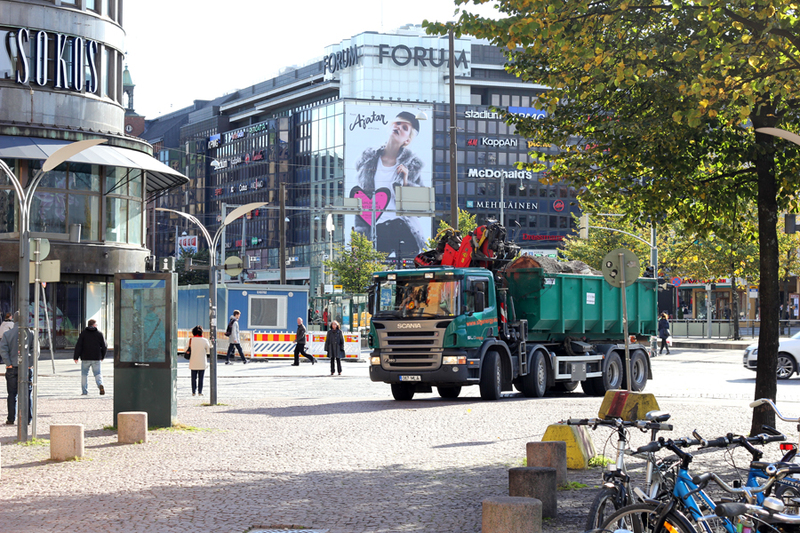 We are loyal to the organizers of Performance Compost in Kiasma and thankful for the invitation. Our statement advocates racialized and exploited East European labor in the West, pointing at the problematics of Estonian immigrants working in Finland. The triumph of the Western global capitalism has created the situation where officially 30 000 and inofficially around 100 000 Estonian immigrants are working in Finland, typically for lower wages than the local workers, leaving their lives, homes and families behind, to the East European country with growing poverty and social catastrophy. Although it started much earlier than in 2004, it is part of the European Union enlargement agenda. According to Austrian journalist Hannes Hofbauer, long before the creation of juridical framework for EU enlargement, the former Soviet lands created three pilars of transformation that would correspond to the logic of the capital: a) hyperinflation and shock therapy; b) creation of the market by renewing the „stagnant“ society and creating new labor market for the Western capital; c) reforms and privatizaion. The hypothetical freedom that the Eastern European countries achieved after the collapse of Berlin Wall in 1989, quickly turned the sensitive post-communist East European landscape into cowboy-capitalist battlefield, preparing space for the Western capital to land, on the expenses of local human lives and welfare. Before we start talking about self-colonization in East European countries and searching for the hidden capitalist spirit inside Soviet communism, that, according to the Western leftist thought, was a failure, we should keep looking at the propaganda mechanisms by which the Western capital exposed itself during the Cold War era. The creation of East European nation states was the necessary input to switch into the machine of global capital and global culture. A typical political coctail in Eastern Europe is nowadays neoliberal politics that go hand in hand with nationalist conservatism. The latter works as a formalist justification and pain killer to cover the bitter truth that East European nation states are masks for global capitalism. Their whole set up – the educational system and mainstream culture included – works as farm of cheap human labor. It is a known fact that East European immigration has it`s economic influence to the Western labor market and social welfare in general. For example, in the case of United Kingdom it is known fact that the East European invasion was high in the same time, when unemployment was increasing. The main reason for this flow is that East Europeans are more willing to do “dirty, difficult and dangerous” jobs for lower wages than the locals would get. The similar thing is going on in Finland, where Estonian construction workers have become almost like a trade mark. The will of East Europeans to do „dirty, difficult and dangerous work“ for lower income cannot be reduced to subjectivities or Protestant work ethics or experience of Soviet communism, as well as it cannot be reduced to the backwardness, destructiveness and brutality of East Europeans. The only cause of this self-destructive will is the social disaster, created by neoliberal politics of East European nation states, surrendering the dictatorship of free market and global capitalism. As a result, the local life suffers – for example the Estonian health care system lacks of quality, because of the migration of the medical workers. The entire social system of the country is moving towards the model of the United States. Such a model has been described by Achille Mbembe and Marina Gržinić as necrocapitalism – a system that lets live those who can socially survive on their own and makes die those who cannot. The similarity of language and culture (whatever that means) has united Finland and Estonia to a certain kind of kinship, which in current situation unfortunately involves above mentioned perversity and abuse. Because of today`s reality, it is becoming the dark side of the hypothetical Finno-Ugric culture and this should make us re-think such cultural relations and constructions from the colonial and neo-colonial perspectives. Similar abusive kinship is going on between Romania and Italy – there is similarity between languages and a hypothetical cultural bridge, mainly meant for the Romanian immigrants to be mistreated and underpaid in Italy. As in that case, the difference between Finland and Estonia has sociogenetic origin – the difference is racial, and it occurs typically in neo-colonial relations between the East and the West, but more specifically, between the Baltic region and the Nordic countries, such as Finland and Sweden. Although the borders within the EU are meant to be dissolved, the East considered to be the former East, and the West considered to be the former West, it is still evident that the borders exist. These are invisible borders between people, based on racist foundation of labor. The dream of freedom – the freedom to live and work wherever you like has turned out to be the freedom to live in terrible conditions and work for lower wages that in Estonian context means good income, and to be separated from your home and family, that are left to the other side of the Gulf of Finland. The subjective freedom is an institution, part of a huge exchange machine that is best displayed in the traffic on the Gulf of Finland – since the end of the 80s there has been the „cultural bridge“ with input of Finnish alcohol tourists and consumers for Estonian prostitution, and output of Estonian immigrant workers, happy to form the new Estonian middle class by being underpaid in the West. Because of the benefit that the Western countries get from cheap East European labor, the poor conditions in the East form the necessary soil for successful harvest. Therefore Estonian poverty as the cause of massive immigration can be seen as the natural resource of Finland, and in that case the Gulf of Finland can be seen as a contemporary version of the Middle Passage. There is an African proverb: „He who doesn`t know where he came from, doesn`t know where he is going“. The official policy of East European countries keeps the Soviet period in the status of trauma and rupture, a blank space between two capitalisms – pre-Soviet and post-Soviet. The time inside the blank space is treated as a bad dream, although the bigger part of lives of many active East Europeans, including politicians, passed during that time. East European identity politics has placed the trauma to the Soviet period, which has juridical and ideological grounds, although the traumatic moment was the fundamental ideological switch – „the new system“, if you wish. The switch of ideology wasn`t only about the political system or way of understanding things – ideology rules the entire life, with it`s past, present and future, with it`s organics and origin. According to many opinions coming from Eastern Europe, in Soviet times people never felt themselves as a senseless biopolitically instrumentalized mass as they feel now. Even in severe cases of social injustice, there remained hope and understanding of truth. But it was like that also in the Western society, during the period before the outburst of global capitalism. Although the entire world has changed, it is important for East Europeans to understand where they come from and where they stand. For the Western countries it is important to understand their post-colonial and neo-colonial liability. 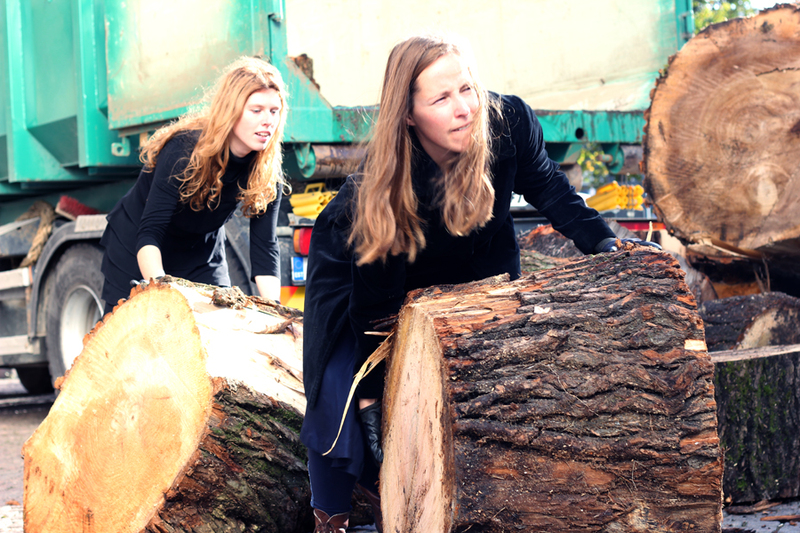 The performance „Human Forestry“ by 10 x 10 meters is dedicated to Estonian immigrants working in Finland, but also to all other East European workers in the West. 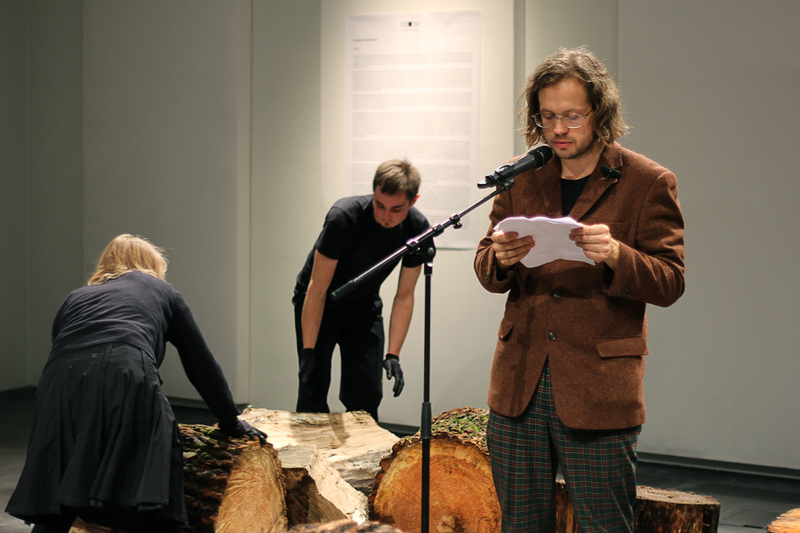 The performance takes place in Helsinki, Kiasma and includes the following: Estonian national resources – timber and human labor – are transported over the Gulf of Finland on the expenses of Estonian taxpayers. 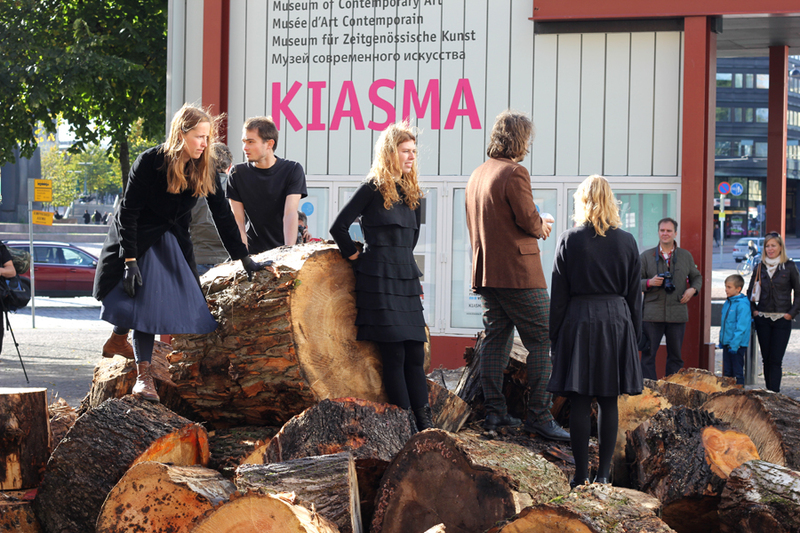 The timber – a huge pile of logs – will be located to a gallery space in Kiasma, by using physical work of four people. Kiasma as the hosting institution for this event is free to interpret, use or archive the embodiment of Estonian labor. Current statement is addressed to Finnish and Estonian societies. 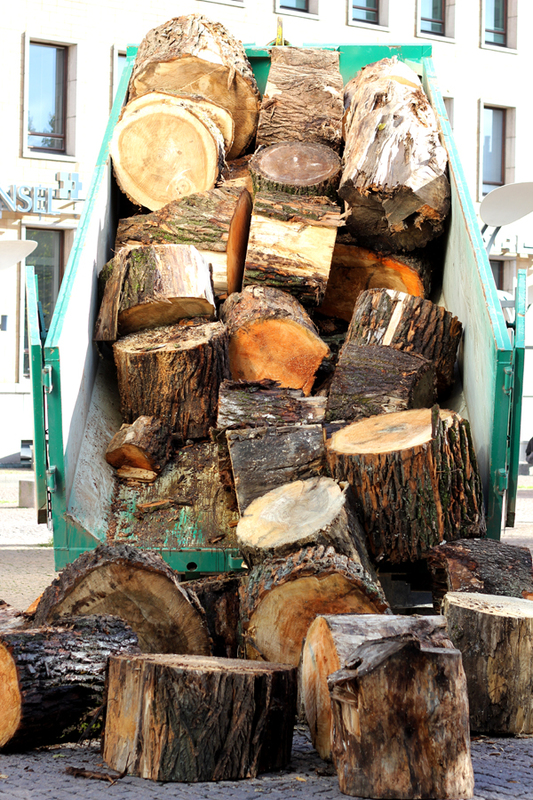 Whoever agrees with us and wants to contribute, is welcome to help us roll the logs in Kiasma 2 PM – 5 PM, 7-th of October 2012.